Get Energized To Burn Fat. Thermogenic Complex. Controls Appetite, Inhibits Water Retention And Helps The Body Get Lean In Five Different Ways. Burn Fat. Increase Energy. Healthy Thyroid Support. The Strongest Name In Sports Nutrition. Looking To Get Lean? 2 Shredded Is The Answer. 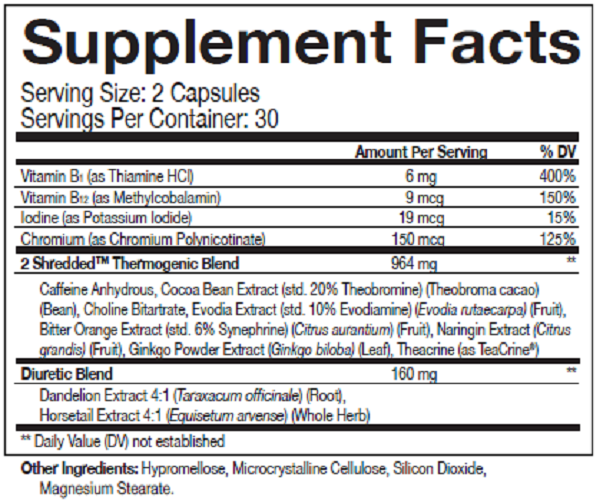 The Unique 2 Shredded Formula Works On Five Different Levels. It Stimulates The Thyroid, Speeds Up Metabolism, Regulates Body Temperature For Burning Fat, Supports The Body's Natural Diuretic Functions And Suppresses Appetite And Hunger Cravings. Beast Ingredients Are Routinely Tested For: Raw Material Identification. Microbials To Detect Bacteria & Mold. Heavy Metals Including Mercury And Lead. As A Dietary Supplement, Take 1-2 Servings (Capsules) Twice Daily For The First 3 Days, Then Continue With 2-3 Servings (Capsules) Twice Daily. Adjust Dose Accordingly. Take With Meals And Drink At Least 64 Oz Of Water A Day. Do Not Exceed Recommended Dosage. Rice Flour, Gelatin (from Bovine), Magnesium Stearate. Check with a qualified healthcare professional before using this product or any dietary supplement, if you are under the age of 18 or if you have any known or suspected medical condition(s) and/or are taking any prescription or OTC medication(s). Discontinue use and consult your health care professional if you experience any adverse reaction to this product. Do not use if you are allergic or contraindicated to aspirin. Discontinue use two weeks prior to surgery or if upset stomach occurs. Contains caffeine. Too much caffeine may cause irritability, sleeplessness and occasional rapid heartbeat. To avoid sleeplessness, do not consume within 4 hours of bedtime. Always try to consume at least 64 fl oz of water daily while using this product. Do not exceed recommended serving size. Allergen Warning: This product was produced in a facility that may also process ingredients containing milk, eggs, wheat, soybeans, shellfish, fish, tree nuts, and peanuts.